As coaches, we love goals. They're exciting, fun and they stretch us and our clients. The problem is we can end up setting goals for the sake of setting goals. And let's be honest, there are so many things we could do or want to do that it's easy to get stuck. In this article I share a 5 Step Process for you to set some fabulous, meaningful goals. You'll need a pen, some paper or your journal and a timer. When setting goals, it's always good to start with the past in mind. So, let's do some time-travel and get some gems to help you create some exciting new goals. Once you know what works and what doesn't then you'll find goal setting a lot more effective. Action: Write out your answers to the following questions. No over-analyzing, this is just a quick review. You've got 10-minutes. Ready, get set, go! What 3 lessons have you learned in the past six months? What dreams have come true? What 3 things are you most proud of yourself for? What would you like to stop, start and continue? In this step we're using the power of emotion. Action: Grab your pen, paper and set the time for 10 minutes! Start by focusing on how you want to 'feel'. Write out 3 words that will help you achieve your goals and bring you the most happiness, eg. Next write down 3 words for how you want the next 6 months or year to be (go with your gut instinct on this one). Write out how you already live those words. Answer the question, "How would my life/business be different if I allowed these 3 words to be my guide?" This is the time to think really big and get excited about your goals. If they don't excite you, don't do them! Action: Pop the kettle on, put on your favourite music (you could also fire up Spotify or equivalent) and get into dream creation mode. First choose 3 empowering words and use these to guide your goal setting (as you did in Step 2). Write down what you would REALLY love to achieve. Convert this into 3 BIG juicy goals - not just the "nice to haves", but the ones that excite you from the top of your head to the tips of your toes. You can choose to do some SMART goal setting here - where you make sure your goals are Specific, Measurable, Achievable, Realistic and Time-related (you've probably come across these if you've done a coaching qualification). F - Make your goal FABULOUS- It MUST excite you. U - Create an UNSHAKEABLE plan - Allow time for things that might crop up. Think about the times you do your best work etc. N - is for NOW. Take action. Don't just let the dust settle on it. Take one piece of action within the next 24 hours. K - KEEP at it. Plan to do something every single day towards your goals. Y - Say YES and commit to success! You can do it, if you just commit and follow through on your plan. TIP: You may be tempted to create lots of goals. Don't! Choose only three, no more. When you achieve those 3 goals you can then move onto setting some more - and keep focused! Sometimes we get stuck in other people's goals and set things that aren't what we desire. For example, it's easy to get caught up in, "I want to make $10K a month" so we set this as our goal, when actually that might not be our real desire. Ask yourself if these goals are what you REALLY want? Do they get you into that 'WOW' place? Moving forward, what will you be/do/have when you've achieved them? Now, KISS (Keep It Simple Sweetie) and set yourself 3 simple action steps for each of your 3 goals. Action: Write out each big goal, and underneath it write down 3 actions to get you started on achieving your goal. 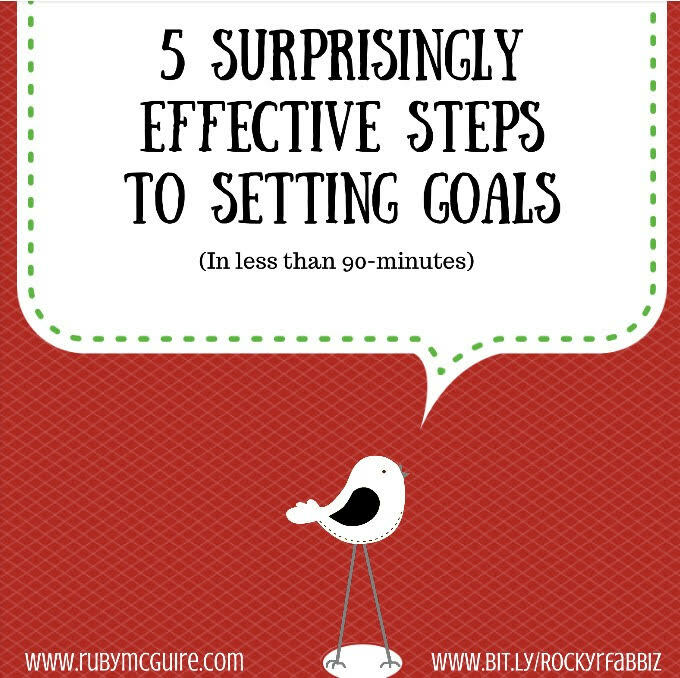 So there you have it, 5 surprisingly effective steps to set your goals in less than 90 minutes! If you stuck to the plan then you should have 3 BIG juicy goals with powerful words to help you stay focused and a simple action plan to follow. Now you need to do the work - it's time to take action! Let us know in the comments what you created as a result of this exercise! If you like this, then you'll love Ruby's Rock Your Visibility Programme where she shares how to attract dreamie clients and create business growth by focusing on one key area of your business at a time. She's currently offering lots of amazing New Year bonuses when you sign up. Contributing Author: Ruby McGuire, Visibility Diva, aka Queen of Connection, is a mum, wife, cappuccino lover and introvert. She helps unseen solopreneurs step up and shine on/offline so they can make money doing what they love. 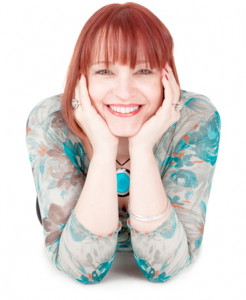 She's an Accredited Senior Coach, Author of Ruby's Visibility Tips, a Trainer, NLP Practitioner & Coach, an EFT Practitioner, writes for International Coaching News & various online articles. Get more Ruby with her podcast show on iTunes: Rock Your Fabulous Biz. You can also find Ruby at her pretty online home or here on Facebook. Failing that she may be satisfying her obsession of pinning on Pinterest! Finally, check out her Visibility Quiz, where you can find out just how visible you really are! Thanks, Ruby! Fun and easy... Nothing works better than that! Happy New Year! Fun and easy is definitely the way to go Deb 🙂 Good luck with your goal setting! Nice guidance to complete the goal setting task.